BULA, CAMARINES SUR – Buli-buli, Hulbot-hulbot, Liba-liba, Hulahoop, Zipper, Likisan, Patangko or Bira-bira are some of the modifications or local names attributed to Danish Seine or Modified Danish Seine. These boat seines considered as active gears consist primarily of a conical netting body, two long wings ,and a bag. An important component for the efficient catch of boat seines is the relatively long weighted ropes extending from the wings, which are used to encircle a large area. Many seine nets are very similar in design with trawl nets, but the wings are frequently longer than trawl nets. Danish seining or anchor seining is an active demersal fishing technique which was invented in Denmark and in the first half of the century became one of the most important fishing gears used there. When this fishing method was brought to other countries including the Philippines, it was modified to local conditions and customs. However, it was found out that the use of Danish Seines or Modified Danish Seines destroys marine habitats and other fishery resources and violates Section 97 of the Amended Fisheries Code (RA 10654). In 2013, the provision was strengthened thru issuance of Fisheries Administrative Order No. 246 banning the use of these gears in the Philippine Waters. Another pivotal step was made to strengthen the fisheries order by including “mere possession” of these gears and/or its paraphernalia as a prima facie evidence that the fisherfolk or the person has committed this violation and would take effect on July 29, 2018. A prima facie evidence denotes that a person may be presumed to have committed an illegal act by mere possession of a prohibited item as an evidence. DA Secretary Manny Piňol signed the FAO 246-1 as endorsed by the National Fisheries and Aquatic Resources Management Council (NFARMC) chaired by the Undersecretary for Fisheries and concurrent National Fisheries and Aquatic Resources Management Council. Violation of Fisheries Code (R.A 10654). On July 25, 2018, joint operations of the BFAR, Philippine Coast Guard Tamban and Bantay Dagat Team of Tinambac, Camarines Sur apprehended 15 crew including the boat captain of FB Jelai. Photo grab from Nonus Enolvus Facebook post. 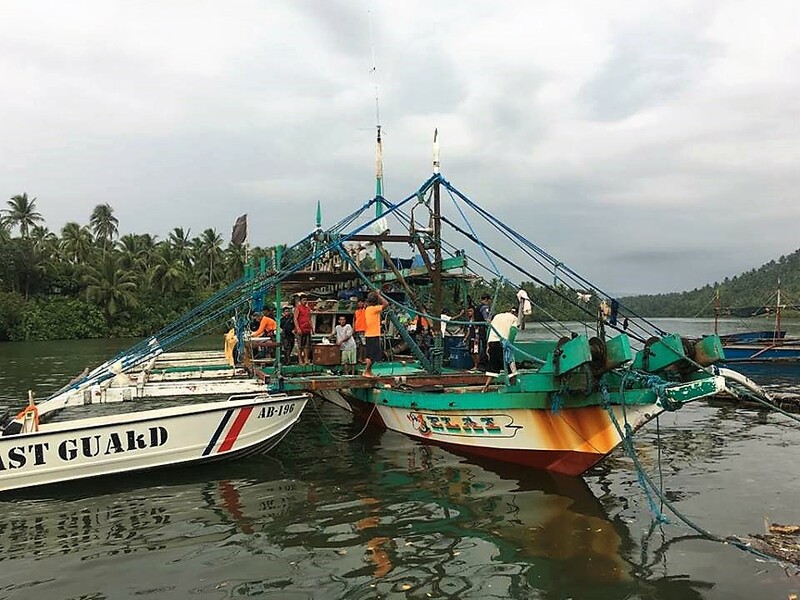 On July 25, 2018, joint operations of the BFAR, PCG Tamban and Bantay Dagat Team of Tinambac, Camarines Sur resulted in the apprehension of 15 crew including the boat captain of FB Jelai. During the conduct of seaborne operations, the team spotted FB Jelai fishing with the use of modified Danish seine within the municipal waters of Garchitorena and upon, apprehension the crew of FB Jelai cut the fishing gear purposely to dispose of the gear as evidence. The fishing boat and gear were held in custody at PCG Tamban while the confiscated 14 tubs of assorted fish were distributed to charitable institutions. Boat captain and crew committed multiple violations of the Amended Fisheries Code (RA 10654) such as Sec. 86 (Unauthorized Fishing), Section 89 (Unreported Fishing), Sec. 90 (Unregulated Fishing), Sec. 93 (Use of Fine Mesh Net), Sec. 95 (Use of Active Gear in Municipal Waters, Bays and Other Fishery Managed Areas), Sec. 97 (Ban on Muro-ami, Other Methods and Gears Destructive to Coral Reefs and Other Marine Habitat), Sec. 113 (Commercial Fishing Vessel Operators Employing Unlicensed Fisherfolk, Fishworker or Crew) along with Fisheries Administrative Order No. 246 (Ban on the Operation of Danish Seine and Modified Danish Seine in the Philippine Waters). Corresponding administrative and criminal charges will be filed against the offenders. BFAR Bicol Regional Director Dennis del Socorro cited that the enforcement of fishery law is now highly strengthened with more national government agencies getting involved in a collaborative effort to totally eradicate illegal, unreported and unregulated fishing (IUUF) not only in the Bicol region but in the entire country. Del Socorro added that the success of the recent apprehensions of IUUF and other enforcement efforts were results of coastal communities giving information of violations as they become more aware of the condition of the fisheries resources. In the coming months, we want to view enforcement to be focused on prevention and promotion of compliance rather than oriented on apprehension. We now expect more compliance not only from our commercial fishers but also from the artisanal fisherfolk. Inclusive growth in the fisheries sector can only be achieved if the stakeholders of the three sub-sectors; the commercial, municipal and aquaculture, come up with a common goal of sustainable development. Glad to read your kind comment, welcome and be back. Love the fish content on your site! You know, most websites get traffic from their blog, and we feel that you could use a little help, since you are not blogging weekly yet. You are receiving this email because the contact form at philexaminer.com is open to the public.